to their communities after being in prison. We were asked in preparing this unit to focus on redemption. Our scriptural lesson finds Jesus in company with those considered sinners When criticized for it, Jesus responds that his work is not with the righteous but with those within the community in need of repentance. 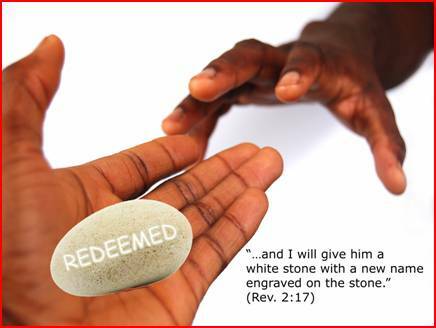 There are many within the African American family who are in need of redemption. However, the role of prison within American society, and its impact on the African American family and community, suggests that not only those who find themselves incarcerated are in desperate need of redemption, but so too is this country’s practice of incarceration. There is a great need for dual redemption. The nation must examine the way it has shifted its laws to block redemptive measures within the criminal justice system, and those who violate the laws of society. The church is called to not turn away but to find ways to reach out and offer support when there are opportunities to aid in redirecting those who walk down the wrong path. The church also is called to be interventionist within the very system of incarceration that so greatly intensifies rather than minimizes the damage to specific souls and their communities. Bob Marley’s famous song, “Redemption Songs,” echoes the duality of the problem: singing of the slavers as pirates in merchant ships and those trapped and sent so far from all we knew. He calls to those of us trapped as we move forward generationally to emancipate ourselves from being mental slaves and free ourselves from that which is destructive to us and our communities. cause all I ever have is redemption songs, redemption songs. We got to fulfill the Book. The text of “He Touched Me,” composed by William J. Gaither, recorded by Shirley Caesar and The Brooklyn All Stars, goes to the essence of Jesus’ statement of his mission to redeem us. ‘Neath a load of guilt and shame. And now I am no longer the same. And oh the joy that floods my soul. He touched me and made me whole. I will never cease to praise Him! I'll shout it while eternity rolls. The evolution of our current criminal justice system has its roots in the founding of the nation. One might say that if the state of Georgia was founded by persons looking at long prison terms in their home country, they would want in the founding of the nation the idea of another chance for those who are found in violation of the laws of the communities in which they live. Over time there have been many different ways that African Americans have been impacted by the criminal justice system---think police, jail, courts--- and, in just as many ways, we have struggled to keep our people from paths that lead to jail and long or repeated prison terms. I want my freedom now! When many of us went to jail, we did not find the cells empty. There were people in jail from our communities, and we wondered how it was that they were there. Maybe they had committed crimes against society and maybe they were just black, and maybe they did not have legal representation. We live in a country with the highest incarceration rate in the world. The top seven states with the highest rates are all southern: Louisiana, Texas, Oklahoma, Mississippi, Alabama, Georgia and South Carolina. Incarceration is overused and threatens the health not just of those who are jailed but of the entire populous. When one finds oneself inside of a system that is calling you out of your name, directing you in such a way that you will fit into a slot in the stream of things that distort your way, is there no resort? Does one just go along, or is it possible to circumvent what seems to be the prescribed journey, go against the tide so to speak and construct a path founded on different principles? The African American legacy has all of it. Within our community we have people at all stages of our evolution in this land of our birth. They have sought and executed all manner of development to create from their imagination, in full consideration of what they thought might be possible, a different future. Seeking to reject, undermine and, in the long or short run, destroy the negative and un-nurturing places created for us. Slavery was an economic system and, as DuBois stated in Souls of Black Folk, our labor built this economic empire that made possible the land we know as America. 5 Slavery was not a good place for those of us who were slaves and, in the end, was not a good thing for the evolution of a future of the nation. Fighting against it sometimes meant working out a way to stay alive and sane day-to-day, or organizing—seeking an opportunity to run for freedom; and finally, a civil war with the nation breaking against itself into a future that saw the system of slavery destroyed. The economic system that replaced slavery shifted things a bit, and African Americans, with support from churches, built schools and courageously made much of the difference. New systems like sharecropping, the chain gang, police systems and political systems run by whites who wished we were still slaves, made being African American in the South in the late nineteenth and twentieth centuries a place of danger. In spite of the dangers, black leaders and sturdy black folk built families, homes, schools, churches and institutions that demanded opportunity for us to be more of what we could be. A large portion of public works projects in the South were based on prison labor, thus fueling the need to have in place a system that sucked young, hardy black men into prisons to do the work. This was the South; nationwide, we faced an urban landscape that seemed to provide an endless supply of our youth into the criminal justice system. Today’s prisons, like slavery, are an economic industry; yes they lock up people, but they are also manufacturers, seeking contracts for producing goods for the wider market using free or cheap prison labor. In various organized initiatives, we are asking, why do we lock up more people than any other place in the world? Why have some political campaigns targeted programs that allowed prisoners to educate themselves and earn degrees to such an extent that many of these programs have disappeared, withering under questions like: Why should criminals be educated in jail with public funds when middle and working class families increasingly cannot afford to send their children to college? What are we to do about creating viable options to keep so many of our children from a path that leads from our homes to schools to the streets to periods in jail? How Early Must We Start? 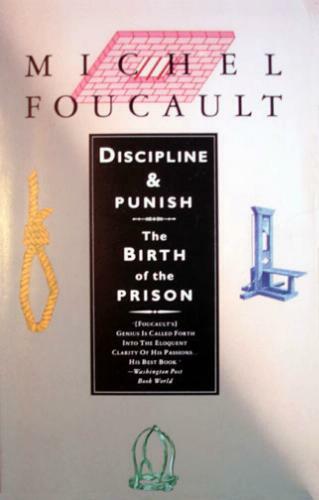 Discipline and Punish: The Birth of the Prison is a book written by the philosopher Michel Foucault. Originally published in 1975 in France under the title Surveiller et Punir: Naissance de la Prison, it was translated into English in 1977. It is an examination of the social and theoretical mechanisms behind the massive changes that occurred in western penal systems during the modern age. It focuses on historical documents from France, but the issues it examines are relevant to every modern western society. It is considered a seminal work and has influenced many theorists and artists. Foucault challenges the commonly accepted idea that prison became the consistent form of punishment due to humanitarian concerns of reformists, although he does not deny those. He does so by meticulously tracing out the shifts in culture that led to prison's dominance, focusing on the body and questions of power. Prison is a form used by the “disciplines,” a new technological power, which can also be found, according to Foucault, in schools, hospitals, military barracks, etc. The main ideas of Discipline and Punish can be grouped according to its four parts: torture, punishment, discipline and prison. 11 This is a must-read book for those interesting in gaining a deeper understanding of incarceration. Churches are not always financially able to operate the types of anti-incarceration programs that their communities need. They may not have the funds to do so or the personnel. However, money and personnel cannot stop churches from becoming involved in anti-incarceration efforts given the epidemic number of African American men and women who are incarcerated. In addition to efforts that keep people out of prisons, our community sorely needs efforts to assist people in jail and prison and those who exit jail and prison. One excellent idea is for churches to partner with proven and respected anti-incarceration organizations. The following are some of those organizations. “The Sentencing Project is a national organization working for a fair and effective criminal justice system by promoting reforms in sentencing law and practice, and alternatives to incarceration. The Sentencing Project was founded in 1986 to provide defense lawyers with sentencing advocacy training and to reduce the reliance on incarceration. Since that time, The Sentencing Project has become a leader in the effort to bring national attention to disturbing trends and inequities in the criminal justice system with a successful formula that includes the publication of groundbreaking research, aggressive media campaigns and strategic advocacy for policy reform. As a result of The Sentencing Project's research, publications and advocacy, many people know that this country is the world's leader in incarceration, that one in three young black men is under control of the criminal justice system, that five million Americans can't vote because of felony convictions, and that thousands of women and children have lost welfare, education and housing benefits as the result of convictions for minor drug offenses. There is a train that rolls through our classrooms, campuses, and our streets picking up our children at younger and younger ages. So intense is this gang recruitment that young children at the age of 4 and 5 think that they will join gangs as soon as they get older. They go to school and the gangs often control the area around the schools and actually often operate in the schools, recruit in the schools, battle each other for territory and members in the schools. Into this terror the contemporary black individuals and churches have begun to take a stand. What is the role of churches? Hundreds of our urban churches are involved in being a part of the solution. Many, like Chicago’s Trinity United Church of Christ pastored by Rev. Otis Moss, III, have prison ministries reaching into prisons to provide support for those inside with continued outreach to those who return to the community after serving prison sentences. An expanding contemporary trend is that many African American churches are also determining that they have to intervene directly in creating and controlling the environment in which our children grow up. These churches are finding public schools not effective enough in protecting the learning and safety of children. To this end, these churches are increasingly opening their own independent schools and playing a more intimate role as parenting partners with African American families. The strategy of church-sponsored schools is as old as African American’s struggle to master the culture and systems that enslaved them to facilitate efforts to change their place within that system. More and more churches are coming to the decision that their work for their community requires them to in fact be a place where children can come and learn and advance without the constant pressure from forces in their communities that pull them toward paths that lead to incarceration or death. 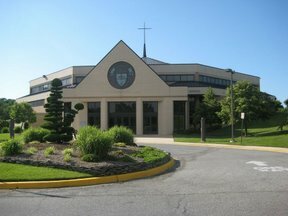 Surveying a few congregations in the nation’s capital, Maryland and Virginia, there has been in the last twenty years a steady increase in church-sponsored schools. Historically, education for Black people was aggressively fostered by the church. Coming through the early decades of Reconstructionism, schools were initially held inside of churches and then the first school buildings were built by local churches. The response by a few of today’s church’s has been to build schools so that there will be a safety zone where children can learn and feel secure. These schools are structured with the reality that whether two parents or single parent homes, 90% of African American parents work to support their families in an intense capital driven society. Parents choose church schools because the schools also provide support for this reality. These schools are a response to a path that currently runs from birth to toddler to day care or no care to local public schools that are danger zones for students and staff; along the way dropping of increasing numbers to the criminal justice system where judges’ roles in determining the best course for saving the young people who come before them are greatly diminished by laws that mete out longer sentences and overloading. Many churches have begun anti-incarceration locations by offering the full range of experiences in worship, learning, training, physical and social development within the church. 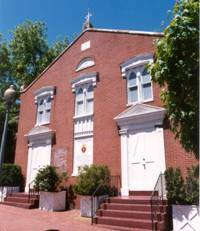 One modern example is that of the Ebenezer AME Church, located in Ft. Washington, Maryland, Co-Pastors Grainger Browning, Jr. and Jo Ann Browning. These two complementary ministries provide support in youth programming and one-on-one or small group mentoring for youth ages 12 to 18. Manhood Rites of Passage for boys ages 12-16. The program is built on the foundation of Biblical teachings and the seven principles of Nguzu Saba, which are known through Kwanzaa celebrations: Umoja (Unity), Kujichagulia (Self-determination), Ujima (Collective Work and Responsibility), Ujamaa (Cooperative Economics), Nia (Purpose), Kuumba (Creativity), Imani (Faith). Titus 2:7-8 – In everything set them an example by doing what is good. In your teaching show integrity, seriousness and soundness of speech that cannot be condemned, so that those who oppose you may be ashamed because they have nothing bad to say about us. Tutorial - A walk-in tutoring program for youth who may be struggling in one or more subjects and require extra assistance. A tutoring program to aid high school students in preparing for their SATs. Exceptional Persons Ministry: Activities include weekly Sunday morning spiritual development activities, a monthly Respite Saturday and monthly meetings with parents, helpers and workers. While Ebenezer is a faith community providing services for its membership through its diverse and comprehensive series of programs and experiences, many congregations have developed their own church schools. One example is a church in Baltimore that has joined the Public School system and created two charter schools. Northwood-Appold United Methodist Church is pastored by Reverend Cecil Gray. This congregation supports two charter schools as a part of the Baltimore Public School System. The Northwood-Appold Community Academy (NACA) is committed to “preparing students to make a living and a life,” so that they “navigate the life journey effectively and with integrity.” (TM) NACA’s mission is to cultivate -- with regularity and predictability -- young people who are proficient relative to academic achievement and intellectual skills; and who are advanced, constructive, and healthy relative to character development. NACA is open to all Baltimore City children in grades K-12. In its first year (2005-2006), it served a total of 126 K-2 students, and today they serve 210 K-4 students. NACA boasts a 7:1 student to adult ratio; as each class consists of twenty-one (21) students, one master teacher, one paraprofessional/teacher’s assistant, and one volunteer parent. We have two classes for each grade level. At the start of each year following the first year, one grade level will be added until NACA culminates at the 12th grade level. Their current context involves some families leaving the city seeking better public schools for their children, while others remain in the city and strain financially as they utilize independent/private schools. NACA is committed to being part of the transformation and cessation of that pattern. NACA is committed to being a reason families decide to stay in -- and return to -- the city and the city's public education system. NACA demonstrates the said commitment by serving the full spectrum of students and families -- from those possessing the lowest through the highest incomes. We know that at every economic level, there are students (and parents) able, primed, and eager to achieve at high levels; and NACA is attracting and working with those people. In partnership with each family, their children, and the community, NACA offers a sophisticated-practical-user-friendly, proficient, twenty-first century, public school. Specifically, NACA is committed to meeting proficiently the specific needs articulated by area families, and local retired and current public school teachers and administrators. From behind the walls of prisons come the poignant messages of conditions that are beyond description. In “Go Down Hannah,” Hannah is the sun. The song is one of the earliest to speak of the incarceration of women. “Another Man Done Gone,” is a prison song that speaks of another inmate who has died while working on a county-farm chain-gang. “Rocks and Gravel,” is prison song sung by male and female prisoners who worked breaking up rock for various building projects and on chain-gangs. Here are two wonderful video versions of this song. The first is performed by the one and only Leadbelly. On his version, he adds verses to the song that are not included in most versions and gives a brief history of the genesis of the song. The second performance is by Bill Sims, Jr.; he sings the song as it is most often sung. The well loved Horatio Richmond Palmer’s hymn, “Yield Not to Temptation,” it both urges one to turn away from temptation and delivers a strong message for where to turn for salvation. “You better Mind,” speaks forcefully of the fate awaiting those who fail to be obedient to the commandments of God. The final song, “Sinner, Where You Gonna Run To?” is a well-known African American song that pointedly suggests that those who violate God’s laws can’t hide from God’s judgment. Look ever to Jesus, He’ll carry you through. See the video of Unshaken from Harare Zimbabwe singing You Better Mind. 2. Marley, Bob. “Redemption Songs.” Uprising. 1979. The song is considered Marley's seminal work, with lyrics derived from a speech given by the Pan-Africanist leader Marcus Garvey. 5. Du Bois, W.E.B. The Souls of Black Folks. 1903. New York, NY: W.W. Norton, 1999. 11. Foucault, Michel. Discipline and Punish: The Birth of the Prison. 1977. New York, NY: Vintage Books, 1995. 18. “Go Down Hannah.” By Huddie "Leadbelly" Ledbetter. Traditional prison camp work song. 24. Ministry with Prisoners & Families: The Way Forward by W. Wilson Goode Sr., Charles E. Lewis Jr., and Harold Dean Trulear.